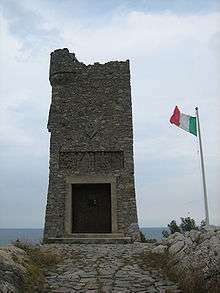 Mausoleum of Enrico Caviglia, Cape San Donato, Finale Ligure. Enrico Caviglia KCB (4 May 1862 – 22 March 1945) was a distinguished officer in the Italian Army. Victorious on the bloody battlefields of the Great War, he rose in time to the highest rank in his country, Marshal of Italy; he was also a Senator of the kingdom. Via Enrico Caviglia in Finale Ligure. 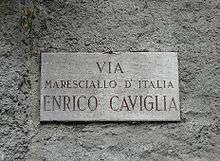 Caviglia was born in Finalmarina (the marine borough of Finale Ligure), the sixth son of Pietro Caviglia and Antonietta Saccone. After early studies in his hometown, in 1877 he gained admission to the military college in Milan. Later on, in 1880 he became a cadet in the Military Academy of Turin; three years later he received his first promotion to Second Lieutenant in the artillery corps. Caviglia took part in the African campaign of 1888/89 in Eritrea as a First Lieutenant in the II Artillery regiment; in 1891 he was admitted to the War School. The year 1893 saw him promoted to Captain; two years later he was attached to the command of Division Perugia. In 1896 and 1897 he took part anew in the African campaign and was present when the Italian army suffered a dreadful defeat in the Battle of Adowa in Ethiopia. By this time, he was known especially for the quality of his works in matters of geography. After several other assignments, in 1904 he was appointed as extraordinary military attaché in Tokyo, Japan, where he was tasked with observing Japanese military operations in the Russo-Japanese War. From 1905 to 1911, he became the titular military attaché first in the Japanese capital, then in Beijing, China. On 22 September 1908 he was awarded the rank of Lieutenant Colonel and honorary Field assistant to the king. In 1912 Caviglia was sent to Tripolitania and Cyrenaica: his task was to overview both the negotiations for the pullout of the Turkish troops and the pacification of Arab and Berber chieftains. On 6 February 1913 he was appointed vice director of the Military Geographic Institute (IGM) in Florence, to reach the rank of Colonel the next year. When in 1915 Italy entered the First World War against Austria-Hungary, Caviglia was made Major General. Next year his troops distinguished themselves in the bloody battles of the Carso, where Caviglia led Brigade Bari in extremely harsh fights at Bosco Lancia and Bosco Cappuccio. Hence his being decorated with the Cross of Cavalier of the Military Order of Savoy "for the skill and valor he exhibited". On 14 June 1917 Caviglia was promoted to Lieutenant General for his merits on the battlefield: in August, as commanding officer of XXIV Army Corps, he overrun the Austro-Hungarians on the Bainsizza plateau, the most brilliant Italian advance in the Eleventh Battle of the Isonzo. After the disastrous Twelfth Battle of the Isonzo, in which he had no responsibility for the defeat, Caviglia received the Silver Medal for his skill in keeping his men united and disciplined throughout the retreat to the Piave line, contrary to what happened in large sectors of the Italian army. He was also transferred to serve as commander of X Army Corps. September 1918 saw Caviglia being made a titular commander of army corps by war merits, and by November he had been put in charge of the new Eighth Army, which decisively crushed the crumbling Austro-Hungarian forces at the Battle of Vittorio Veneto. After the war, King George V of Great Britain awarded him the rank of Knight Commander in the Order of the Bath; Enrico Caviglia was now a Sir. On 22 February 1919 he was appointed Senator for life, and later took part in Vittorio Emanuele Orlando's first government as Minister of War. 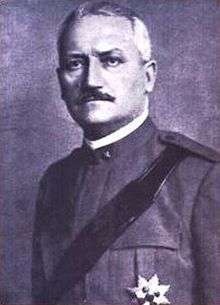 When Gabriele D'Annunzio occupied Fiume with his "legionnaires", Caviglia was called to replace general Pietro Badoglio, dating from 21 December 1920, as troop commander and extraordinary commissioner in the Venezia Giulia. From 24 to 31 December 1920 he led the repression of D'Annunzio's movement, the so-called Natale di sangue (Bloody Christmas) in execution of the Treaty of Rapallo. This act was to charge Caviglia with grievous doubts to the end of his life, doubts he expressed in his personal diary. 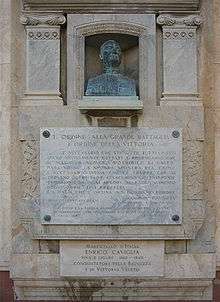 Monument to Generale Enrico Caviglia in Finale Ligure. On 25 June 1926, Enrico Caviglia was appointed Marshal of Italy (Maresciallo d'Italia). This was the highest military rank in the Kingdom of Italy. Four years later, he was made a Cavalier in the Supreme Order of the Most Holy Annunciation (Ordine Supremo della Santissima Annunziata). Caviglia thus became a 'cousin' of King Victor Emmanuel III. Opposed to Benito Mussolini's policies and regime, he was overshadowed by other officers, less able on the battlefields but more prone to power and ideology. In 1943, from 8 to 13 September, as the king's court fled the incoming Germans after surrendering the country to the Allies, the aged Caviglia had to take the military command in Rome and to negotiate with Field Marshal Albert Kesselring the surrender of the capital in exchange for the respect of its theoretical status as open city. By this time he had developed an intense dislike of Badoglio (who was defined by him once as "a barn dog that goes where there is the biggest morsel"), who had left him in dire straits thrice: in Caporetto (1917), in Fiume (1920) and then finally in Rome, benefiting in the meantime of the favors of the Fascist regime. Caviglia eventually retired to his villa, named Villa Vittorio Veneto, in Finale Ligure, to die just a month before the end of World War II. His body was interred in the Basilica of St. John the Baptist in Finale Ligure Marina, but on 22 June 1952, under the eyes of Luigi Einaudi, President of the Italian Republic, and former prime minister Vittorio Emanuele Orlando, his remains were finally reinterred in the tower of Capo San Donato, just east of Finale. Caviglia left a Diary which documents the evolution of his thought on many subjects, his skepticism about the Fascist regime, as well as his confusion about what was going on in World War II, a world he could not recognize any more; plus he left military memoirs and geographical treatises and works. Quirico, Domenico. "I vincitori". Generali. Mondadori. "Caviglia, Enrico". Encyclopædia Britannica (12th ed.). 1922.